A fantastic response with large numbers and continued feedback from parents has the programme returning to this venue once again, before it continues around the island. All children boys and girls aged 5-13yrs are encouraged to come and have some fun while having a go at the activities on offer from Just Play, Soccer, Rugby, Cricket, Netball and League. Physical Activity is this month’s health message that will be delivered by Public Health’s Karen Tairea, who will no doubt emphasise the World Health Organisations recommendation of 60 minutes of moderate exercise for children a day. 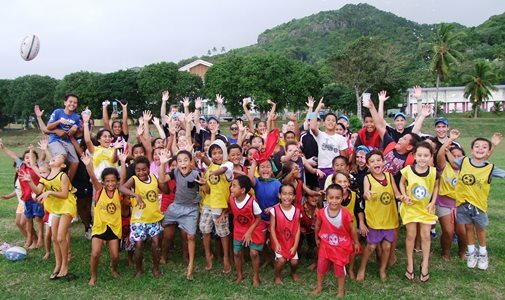 Just Play’s Project Manager, Michelle Paiti says this community initiative is using sport as a tool, aiming to provide positive experiences for children while helping to promote awareness of key health messages that will help improve the lifestyles of our children in the future. The opportunity for children to be physically active after school is really important, especially these days with all the technology being introduced says Paiti. Parents, what better way to keep the kids occupied while they are waiting for you to finish work, drop them down to Tupapa field where they will be active, supervised and safe. All are most welcome. Water will be provided throughout the activities but we encourage children to wear hats or sunblock to keep them safe from the sun. Paiti would like to acknowledge and thank the continued support of Australian Aid who fund the Just Play Social Development Programme and also all our local partners who are involved in this community initiative.